Over the past 15 or so years of my hifi journey I have focused primarily on speaker drivers, tubes and tube amplifiers, setting aside what I viewed as “secondary” components such as DACs, cables, phono preamps, etc. I simply couldn't afford to do everything and rather than go about haphazardly changing things I settled in on a constant reference for secondary components, feeling that this would level the playing field so to speak, and allow new amps or drivers to show what they really sounded like in comparison to the gear they replaced. In this way, for years now I have relied on my tried and trusty MHDT Labs Paradisea+ DAC with a Western Electric 396a tube, and have been more than satisfied with its performance. As time went by and I finally settled on a few top-shelf choices in amplification, I eventually branched out and began experimenting with other components. Enter the Eastern Electric Minimax Digital Analog Converter, a truly stunning piece of equipment that has brought a new voice to my system as a whole. 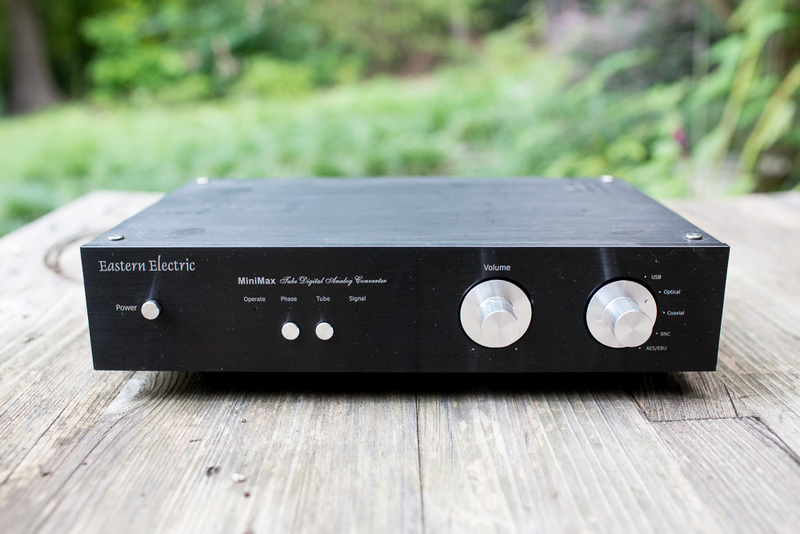 Eastern Electric is a name I’m familiar with, their Minimax tube preamp has been a staple in my system for ten years now, and has brought a level of performance and dependability that is hard to match. So after reading the near universally positive impressions of their Sabre-chipped DAC, I picked up a used unit that had been upgraded with higher quality Burson Op-Amps. After rolling in a 1950’s RCA clear top 12AU7, I can say for sure that the Minimax DAC is a stunner. Immediately upon insertion into my system (via optical from a Power Mac streaming Apple lossless files from iTunes and Spotify from the web) I noticed a clarity and presence that seemed at first to be head and shoulders above the MHDT Labs unit. Voices had new place and a perceived size increase, individual notes sparkled in a way that was new and the whole picture seemed more dialed in. After living with the Minimax voice for a few months, I switched back for a weekend of listening through the MHDT Labs. Interesting it still sounded quite good to me, perhaps more “laid back” but not lacking in detail as I had feared. If anything the non-oversampling MHDT Labs DAC sounds more like good analog reproduction, for better or worse. Going back to the Minimax, things brightened back up and dialed back in to 11. I’ve settled in on the Minimax as my digital reference for now, but the older MHDT unit is a close second for me and sits atop the Minimax waiting for its turn. If I had to choose only one DAC, this would be the one, but I’m happy to have two high quality DACs on hand to allow some flavor variety. 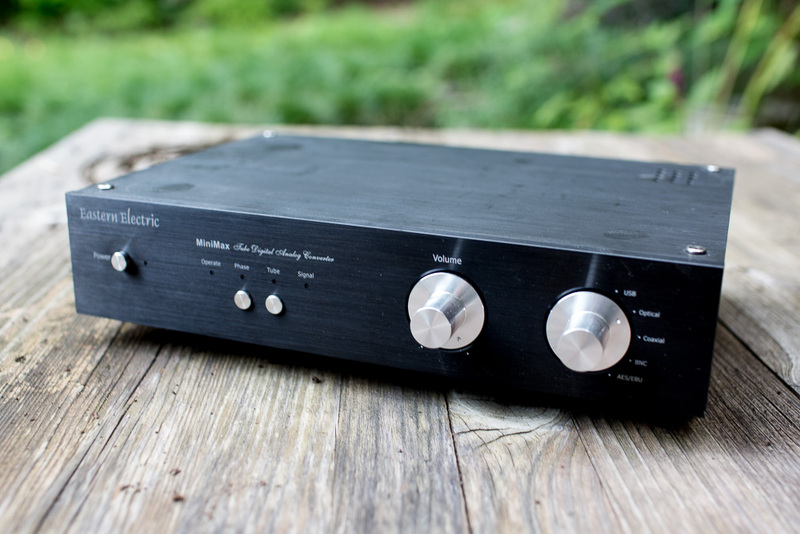 This DAC offers the user the choice of tube or solid-state playback. So far I have spent most of my time using the tube option, with an RCA clear top 12AU7, which I feel is the best of the 12AU7 family. Rumor has it that the DAC sounds even better in solid state with the tube taken out. One rainy Saturday I'll get around to trying that option out. Plenty of hookup options here! Like all Eastern Electric gear, this is a high quality, well made unit with a robust construction. 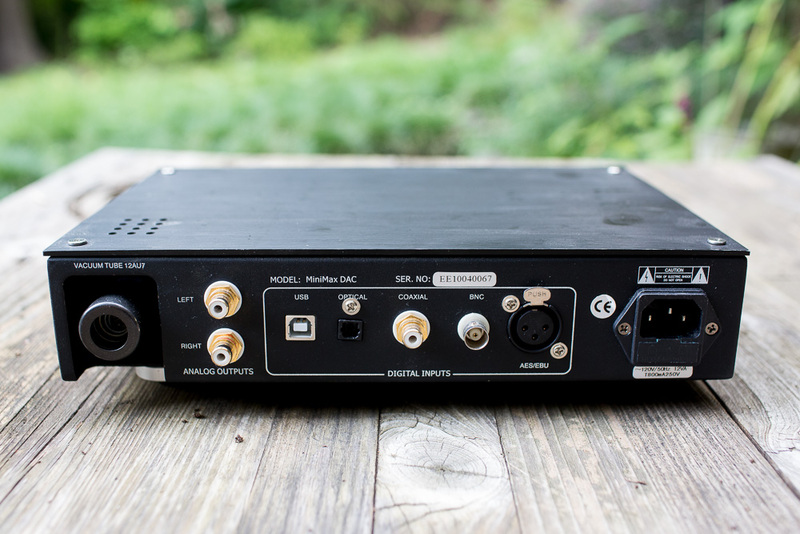 The built in volume control also allows this DAC to function as a preamp if desired.